There are multiple techniques to hang a bear bag, but when I first learned the Pacific Crest Trail (PCT) method, it’s been my favorite option. The PCT method is actually pretty simple to set up, but is very effective to deter animals trying to get at your food. The PCT method uses a single rope that is tossed over a high, sturdy branch and is then clipped to the bear bag with a mini carabiner. The standing end of the rope is clipped back through the carabiner and then the bear bag is hoisted all the way to the top of the branch. At this point, use a small stick (or even a spare stake) to use as a toggle. Tie a clove hitch with the rope around the toggle as high as you can reach up on the rope. When you slowly release the cord, the bear bag will stop at the mid point when the toggle connects with the carabiner. The PCT method uses less cordage, which can help reduce weight and bulk in your backpack. It is harder for a bear to foil, compared with a traditional approach of tying the line to another tree. Bears have been known to slash at the line to drop a bear bag. Since the line hangs down, there is nothing for a bear to slash. Works very well in deciduous forests or with pine tree varieties (e.g. Ponderosa Pine) that have overhanging branches. Heavy bear bags make it a little harder to tie the clove hitch around the toggle. Splitting up smellable items into multiple bags can be a downside, but essential for larger groups. Doesn’t work well (or at all!) in locations where there is a lack of overhanging branches. Some pine forests, for example, lack sufficient tree variety making it impossible to use the PCT method effectively. I prefer using a slippery line that will glide more easily over the trees and prevent cutting into the bark. I highly recommend the Spectra kit from AntiGravityGear.com, which comes with a lightweight throw bag that doubles as a storage bag for the line. I use a lightweight cuben fiber or silnylon stuff sack as my food bag, which can then double as the bear bag. The cuben or sil fabric is waterproof, which helps to protect my gear when hanging in the rain overnight. All told, this kit can weigh as little as 2 oz (57 g) or less. I also recommend the UL Deluxe bear bag kit from AntiGravityGear, which includes the throw rope, silnylon storage bag, and an inner Aloksak oder-resistent bag. Another key element to hanging a bear bag is location. You should hang the bag well away (200 ft/60 m) and downwind of your sleeping area. Your kitchen area should also be 200 ft (60 m) from your sleeping site. Everything that smells (e.g., food, garbage, hygiene items, food-soiled clothing, etc.) should be placed in the bear bag for safety. Clean stoves, pots, water bottles, and utensils can be safely left in the kitchen area. For more information on bear bagging and respecting wildlife, please visit the Leave No Trace Center. If you would like to use this illustration in a workshop or training event, please contact me for a high-resolution version. I first published a rough version of this illustration on HammockForums.net in April 2010, and I’ve updated it for a re-release on my website. I would like a high res version for use wiht my Scout troop. It was my understanding that in the California, Yosemite stretch of the PCT trail the bear cannisters are not optional? Exactly. I should clarify that “PCT Method” doesn’t imply that this is what is used or required along the PCT. I believe the etymology of this phrase is that it was developed by folks along the PCT. You can use this method anywhere where bear bagging is allowed. For areas where bear bagging is not permitted be sure to follow local guidelines. Just an FYI. My friend recently received a $75 ticket from rangers in the John Muir Wilderness for using the PCT method instead of the approved counter-balance method. Apparently the counter-balanced method is spelled out on the permit and even though many ranger may allow the PCT method, there are those that will go “by the book” and give out tickets for anything other than counter-balance. I would be interested to know how the counter balance method has any bear-proof advantages over the PCT method. That said, it’s always a good idea to follow the rules. Usually, those rules are based on field evidence (e.g., the use of canisters in some parks/areas). I also would be interested to know how the counter balance method has any bear-proof advantages over the PCT method.Ditto on following rules too. I’ve read reports that there are black bears along the Appalachian Trail which have already figured out how to steal food bags hung by every intricately devised hanging option. Bears will stand on each other’s backs. Bears will climb out on the limb and try to break the limb. If a bear wants your hung food bag, she’s gonna figure out a way to steal it. Some bears in the Adirondacks have learned how to open the BearVault. Bear Bagging keeps the “honest” bears from taking your food … along with many other ‘critters’ …. remember, a fed bear is a dead bear. Do your best but have a back up plan if you lose your food. From what I’ve gleaned from trail journals and reports that I’ve read over the years is that there are a lot of “lazy” backpackers who don’t take bear bagging seriously, and as a result, we’re seeing an increase of human/animal encounters. It only takes a few times–perhaps only once–for a bear to “learn” where easy food is located. It is essential for anyone heading to the backcountry to take “respecting wildlife” seriously. I was recently contacted by the Appalachian Trail Conservancy for permission to use this illustration to address this very issue. I’ve been using the PCT Method for a couple years and often get asked about the line hanging loose under the toggle. I let it hang, but some question whether a bear can tamper the with line and jar the bag and toggle loose. I saw one person tie the loose end off to a tree, which I think defeats the purpose. Your thoughts…? Thanks John. I think much depends on the type of rope/line you use to hang the bag. My preference is to use the Spectra cord. It’s very strong and difficult to chew through, with a breaking strength of 725 lb (329 kg). This type of line is much more difficult to bite and grasp, especially for animals without much dexterity (I’ll be honest that the Spectra line can be a little hard to grasp for human fingers). If you use the PCT method AND you tie the loose, hanging end to a tree, it won’t defeat the PCT method, so long as the bag is hanging on the toggle. If the bear pulls or is able to somehow slice through the rope tied to an adjacent tree, the bag will still hang there. The only way to defeat this method would be for a bear to climb the branch and cut through the rope at the top. With the thin, strong Spectra line, that is made more difficult. Bears are known to “give up” when their attempts are thwarted. Its been our experience in Yosemite that bears will climb out on the limb and either break it or chew the rope. The best way is to string a cable between two trees and hang counter-weighted bags over the cable. The bite of the line should be coiled and set on top of the second bag while at ground level with a loop that hangs just below it. Push the lower bag up with a stick until the two bags are even. To get the food down hook the stick in the loop that is below the bag and pull them down. Yosemite has special regulations about securing food and items with odor. The PCT method–or any bear bagging method for that matter–is not permitted in the park because the bears have learned how to get past these methods for the most part. Only approved canisters are allowed in the park. The counter-balance method is effective, as you say, in places that have a man-made structure with wire cables. But in that example, the PCT method would be equally effective since the bear cannot get through the wire cable and metal poles. If they were able to somehow grasp the dangling line, the best they could do is pull the bag up, which doesn’t get them the food. Personally, I’m not a fan of the counter-balance method because it is a little trickier to master. ANotehr point to note is that the branch should not be any larger than 1″ diameter at the point that the rope goes over. Years ago, I hung my food per all the notes, except that the branch was maybe 3″ where the rope went over. In the middle of the night, I awoke to a bear pushing through the small branches at the trunk to get to “my” branch. As the bear walked out along the limb, I was thinking “too bad, the food is still about 7′ below you”. To my surprise, the bear sat on the branch next to the rope, reached down to hook the rope with a paw and had my food in her lap, faster than you just read this sentence. With much yelling and banging of pots, I scared the bear further up the tree, after losing only three food items and a torn stuff bag. I picked up the rest of my food, now on the ground, and moved my camp almost a mile away in the darkness. Going back to watch the bear come out of the tree, she had taken her cub up the tree with her to teach the process, in case I had used a smaller branch that would not have taken her adult weight. Great art and enjoyable read – will keep it handy. Thanks for posting Derek. And the tale from Eric SoCal – wow, lol! Brilliant illustration and well explained. I just thought I should suggest the additional warning about snaggy branches (mossy / dead bark covered) – the PCT method seems particularly prone to spectra lines sawing they way into the branch and getting tenaciously stuck! Thanks Oliver! I’ve never had problems using spectra cord sawing through or getting stuck, but I know that can happen with other types of line I’ve used. Spectra is very light and slippery and doesn’t saw into the wood like other line, which is why I recommend it. Thanks for the tips on how to hang a bear bag. This is a very useful method and is important to stay safe while you are camping. You don’t want bears to be able to get to your food because that puts you in danger. 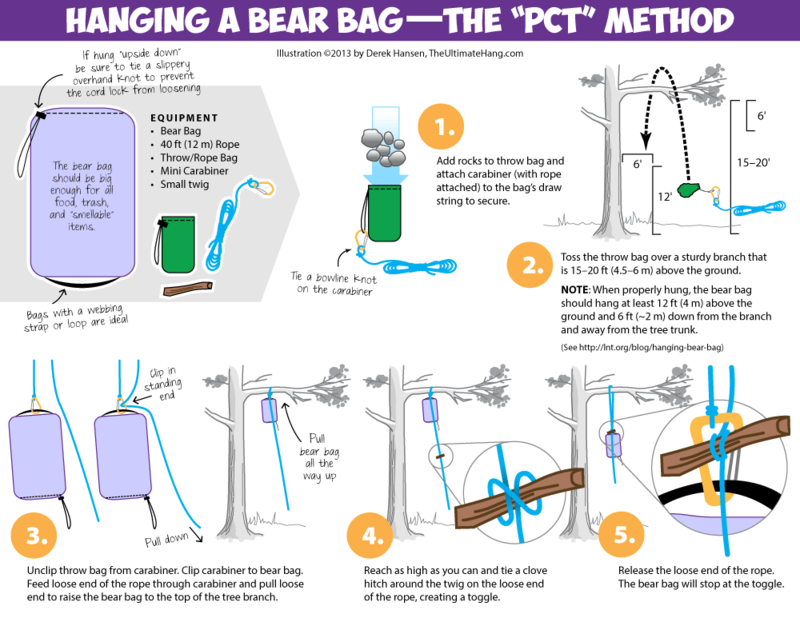 Great illustrations, I would love high resolution versions of both the “Hanging a Bear Bag – The “PCT” Method, and the “Bear”-muda Triangle, for use at our Sea Scout group. Thanks Peter. I sent the files to your email. Silly question. Would it be preferred to use a dark colored bag as opposed a brighter color? Obviously a brighter color would be easier for me to find the next morning but would it also draw attention to a bear as opposed to a black bag? Good point. There is some fantastic research that indicates bears are attracted to bright colors. The evidence affirms that bears are intensely curious, and the brighter colors present a novelty to be investigated. In the tests, camouflage gear was mostly ignored compared with the colored versions. If you are trying to avoid a bear encounter, going with muted or camo colored gear is advisable. I made the mistake once of putting the loose end of the rope through the carabiner. In the morning, when the line wouldn’t easily slide on the branch, I was kinda screwed because there was no way for me to change the angle to get the bag to drop. So while I agree 99% with these instructions (and use them every time I’m out which is quite frequently), I say don’t put the line through the biner. If you don’t put the line back through he biner, how do you toggle the bag in position? This is the PCT method. Without that toggle you must tie the line to another object. I must hear more of your story because in my experience, the loose end is not weighted and cannot counterbalance the bear bag by itself and so would slide easily against the weight of the bag. Please tell me more on what you are doing. I tie the line off on a nearby tree. The advantage to a counter balance method, is that there is no rope hanging down from the bags for the bear to latch on to and pull the whole caboodle off the end of the branch. Actually, the PCT method is resistant to Bears pulling the rope because it is difficult for bears to grab. They are known to swipe and cut line. Small, thin line is much harder even for their mouths to grab. If they are able to grab the dangling line and pull it, it will only pull the bag up. The way that bears usually defeat the PCT method is the same way they defeat the balance method: by climbing out in the branch and scooping the line and pulling the bag up. This is rare, however. So simple, yet so clever! Or is it so clever, yet so simple…. What’s the proper process to get this down in the morning? I don’t understand how that works…..
Easy! You pull the toggle down. As the line that holds the toggle comes down, the bear bag goes back up. That sounds counterintuitive but once you can reach the toggle and remove it , you can release the rope and let the bear bag down. Thanks! I just wasn’t picturing how this whole thing worked! Great! Dear Derek, such great Information and illustrations. 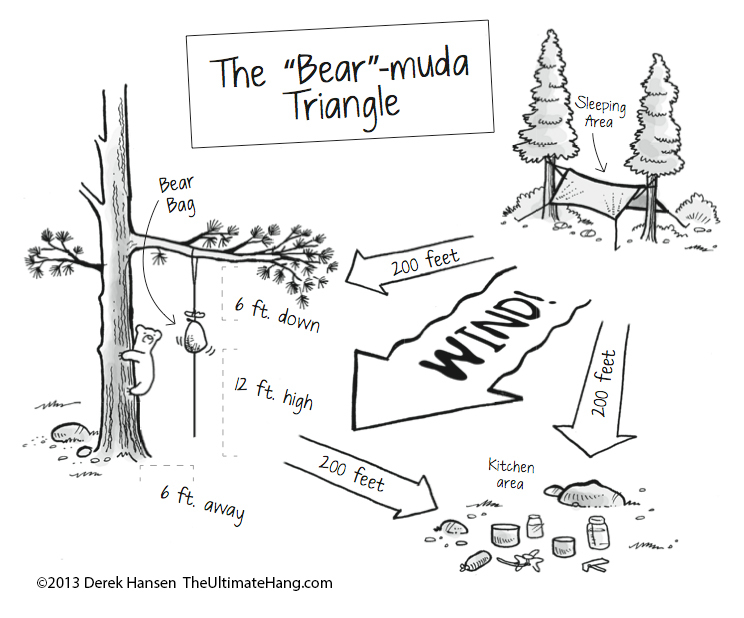 I really had to laugh about the little bear in the tree in the bear-muda triangle! I am currently preparing a journey to “bear country” and I am therefore writing a post on my blog in German. I would be glad if I could use your illustrations and convert some of the numbers into the metric system. Thanks for this! Currently getting ready to leave for a week-long trip through NJ on the AT (yes, actually notorious for bears!) All the shelters have bear boxes, but if you camp at a non-designated campsite, you do have to throw a bear bag. Believe it or not, it all my time backpacking, I’ve never had to do this! Always stayed somewhere with a bear box. But this is invaluable information, and I appreciate it fully! You’re welcome. Good luck on your next trip! I know this question will likely seem dumb, but I’m not really experienced at backpacking or being in bear country. How do I get the bag down if it’s 12 feet up in the air? The PCT method is unique in that it hangs suspended. It seems counterintuitive, which is why it is often more effective at eluding bears than just tying off one end to an adjacent tree (which bears more frequently find and cut down). To get the bag down, you pull back down on the rope that has the toggle. The bear back goes back up to the top of the branch, but you now have the toggle in hand. Remove the toggle and release the rope and the bear bag will slide all the way back down to the ground. Easy! Thank you, Derek. I get it now. I’m going on my first multiday hike on the Midstate Trail in Massachusetts. Not exactly prime bear country, but I’ll be using the PCT method to give the squirrels, porcupines and raccoons a harder time of it. Would you recommend I include a bag of mothballs on the outside of my bear bag to deter pesky critters like these? It’s those “mini” bears that are the most problematic, but in my own backyard, those are the most common: ringtails, raccoons, and squirrels (and sometimes mice). You won’t need anything more than a regular bear bag to make this work. I understand the concept, but I am short (5′ 2″). How am I supposed to reach up 12 feet to tie a clove hitch? This is the part I can’t grasp. When you pull the bag up, you pull it as far up as it will go. Then you reach on that line as high as you can to tie the clove hitch on they toggle. Since the bag is clipped to the line as you release that toggle it will go up as the bag comes down. They meet somewhere in the middle, about 12 feet or so. Let me know if that makes sense. Ok, I think I will practice this at home before I need to do this on the trail. I work with a day camp that does overnights in Harriman State Park here in New York. I have been with them for a little over thirty years. In that time we have encountered all sorts of bear bag situations and observed that over the years the bear community has developed an impressive learning curve about hanging bags. We have incorporated your illustrations Derek, and continue to teach our youngsters about camping in bear country but at this point when I’m out alone for a few nights I must admit that I make use of canisters, do no cooking, and eat foraged wild edibles as much as possible. net. You definitely understand howw to being an issue to light and make it important. since youu definitely possess the gift. I have recently hiked about 200 mile sof the northern sierras, southern cascades, of the PCT. I have had a really hard time ever finding any horizontal branches upon which to hang a bear bag. 1. Would it be better here just to use a Ursak bag and tie that to a tree? 2. In the Georgia portion of the AT, are there a lot of horizontal branches to be able to use the Pct method, or should I use an Ursak bag instead? To be honest, I’m not a big fan of the Ursak. I had one and used it as instructed and while my food was “protected”, the little critters gnawed every morsel and put their nasty saliva all over it, making everything inedible. I’d recommend a bear canister instead, every time. When I moved to Flagstaff, I saw the same thing you experienced with the trees along the PCT. However, I also found that after time I realized that there were plenty of trees that could work, it just took some adjusting. After all, the PCT method was developed on the PCT trail. There are other hang methods, so if this doesn’t work for the trail you’re on, I might use more traditional two-tree methods or canisters. Great illustrations, I would like to have high resolution versions of both the “Hanging a Bear Bag – The “PCT” Method, and the “Bear”-muda Triangle, for use at our Boys’ Brigade. Wow! Two very nifty tricks: the throw bag, and loosely dangling retrieval line that can’t be slashed. And the best part is that I might finally stop braining myself with poorly attached throw rocks. Thanks so much! I’ve got a bear story. Back in ’98 I’d been camping in the NF at the base of San Francisco peaks in Arizona for a few months. I cooked my food in camp and my stored was in the tent. I’d had mice and skunk periodically scavenge crumbs and owls rapture mice that were scavenging. One night fast asleep in the tent, I felt a nudge against my left shoulder and an deep inhaling. My first reaction was to inhale deeply and what a stench. As I opened my eyes to total darkness, I yelled “baaaaaar!! !” The next thing I heard was that bear’s paws pounding the ground like a shaman’s drumbeat and breaking brush and limbs as it made a beeline away. I rolled over laughing and went back to sleep. They don’t want much to do with us two-leggeds, because we’re so damn dangerous and unpredictable. Heck, our kind hunt down and kill their kind for no good reason. If I was a bear I’d be wary of humans, too. Surely you can’t blame anyone for wanting to eat, can you?